WASHINGTON—Small businesses make up 99.9 percent of U.S. businesses and employ almost half of all U.S. workers. But they’re struggling to compete with their bigger counterparts—for sales, jobs, and real estate. Nine years ago, Small Business Saturday was created to promote small, mostly local, businesses that don’t get the attention big box stores do on Black Friday, the day after Thanksgiving when many stores offer double-digit discounts. The day was started in 2010 for the more than 30.2 million small businesses to help them get back on their feet after the 2008 housing crisis, according to the U.S. Small Business Administration. It wasn’t started by a small business, though. American Express, which Forbes placed 28th in its list of most valuable brands, started the now annual sale day. In smart business fashion, it has also trademarked it. In 2011, the Senate passed a resolution marking Nov. 26, 2011, as Small Business Saturday. The next year, all 50 states participated in it. American Express estimates the event has generated $85 billion for small businesses since its inception. Last year alone, $12 billion was spent at independent neighborhood retailers and restaurants, estimates the Small Business Administration. Of that, about two-thirds, or $0.67 per dollar, stays in the local community, according to American Express’s Small Business Economic Impact Study. This year, New Mexico has gone a step further with the day by passing a law exempting businesses with 10 employees or fewer from paying taxes on a number of goods, as long as the purchase does not go above $500. The day doesn’t just promote local businesses, though. E-commerce site Etsy, which specializes in handmade and vintage goods, is hosting pop-up markets in 13 cities in eight states and the District of Columbia on Nov. 24. Some of its online retailers are also observing the day by offering discounts through their Etsy stores. Small Business Saturday is just part of American Express’s Shop Small Movement, a 365-day initiative to promote its brand, its credit cards, and its customers—small businesses. Its map, for example, shows the local businesses where American Express cards are accepted. 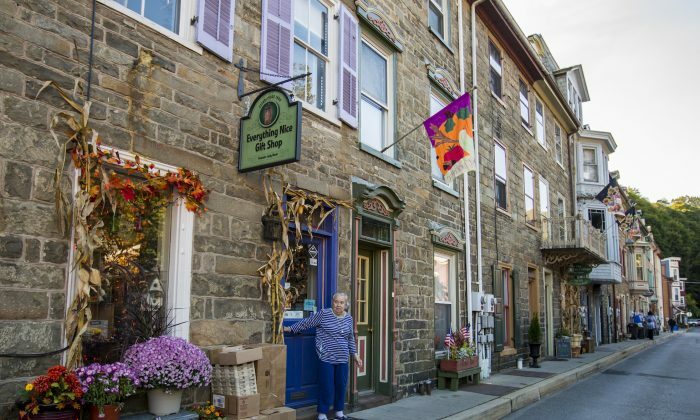 William Jones, the owner of Allegory Gallery in Ligonier, Pennsylvania, told the Tribune-Review that all the marketing for the day has paid off. This could be in part due to a surge in consumer spending that pushed the GDP growth rate up to almost 4.2 percent in the second quarter this year, the highest since 2014. But for small businesses, the rapid growth also presents a challenge, according to Linda McMahon, the head of the U.S. Small Business Administration (SBA). “We have a workforce shortage because unemployment is so low, so small businesses are competing for that,” she said on USA Today. Part of her mission at the SBA, she said, is to ensure that workers have the training they need to fill that gap, an initiative that dovetails with the White House’s push to provide more training for felons so they can join the workforce once they get out of prison. A previous version of this article misidentified the location of Allegory Gallery, which is in Ligonier, Pennsylvania. The Epoch Times regrets the error.